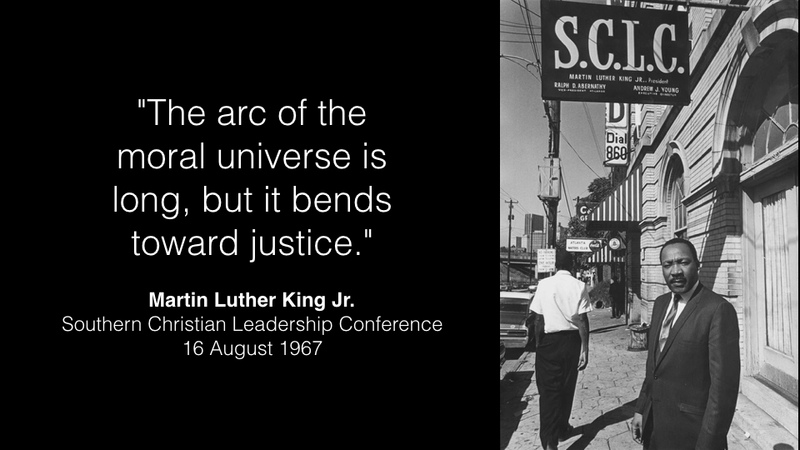 Honoring Martin Luther King Jr – We must help bend the arc of justice by working together. With MLK… it is always hard to know where to start. Very few in history have ever so effectively combined ideas, action, eloquence, courage, and passion for justice for all as he did. The only modern figures that I know that come close are Gandhi, and Mandela. And as I understand what he was saying, the arc does not bend by itself, and we can also bend it more quickly by working together in concerted action. We must bend it by standing shoulder to shoulder to help “cash the promissory note” that was promised so long ago. We must do so by learning from his example, and by ensuring that no one stands alone in their pursuit of justice. I like to focus on his action and courage. In the coming years, we are all going to be called upon to step out of our comfort zones and to take considerable risks to advance His cause. Deeds rather than words alone will be best way to honor what he did for our country. The above writing was originally posted to Facebook on MLK Day, 16 January 2017 @ 2:40 PM CT.